1. Cairo MS, Bishop M: Tumour lysis syndrome: New therapeutic strategies and classification. Br J Haematol. 2004; 127(1): 3-11. 2. Coiffier B, Altman A, Pui CH, et al:Guidelines for the management of pediatric and adult tumor lysis syndrome: an evidence-based review. J Clin Oncol. 2008; 26(16): 2767-78. 3. Cheson BD:Etiology and management of tumor lysis syndrome in patients with chronic lymphocytic leukemia. Clin Adv Hematol Oncol. 2009; 7(4): 263-71. 4. Jeha S: Tumor lysis syndrome. Semin Hematol. 2001; 38(suppl 10): 4-8. 5. Cairo MS, Coiffier B, Reiter A, et al:Recommendations for the evaluation of risk and prophylaxis of tumour lysis syndrome (TLS) in adults and children with malignant diseases: an expert TLS panel consensus. Br J Haematol. 2010; 149(4): 578-86. 6. Davidson MB, Thakkar S, Hix JK, et al: Pathophysiology, Clinical Consequences, and Treatment of Tumor Lysis Syndrome. Am J Med. 2004; 116(8): 546-54. 7. Howard SC, Jones DP, Pui CH:The tumor lysis syndrome. N Engl J Med. 2011; 364(19): 1844-54. 8. Mayne N, Keady S, Thacker M: Rasburicase in the prevention and treatment of tumour lysis syndrome. Intensive Crit Care Nurs. 2008; 24(1): 59-62. 9. Friedman EA: An introduction to phosphate binders for the treatment of hyperphosphatemia in patients with chronic kidney disease. Kidney Int Suppl. 2005; (96): S2-6. 10. Richard A Larson, Ching-Hon Pui: Tumor lysis syndrome. UpToDate, 2011; ver 19.2. 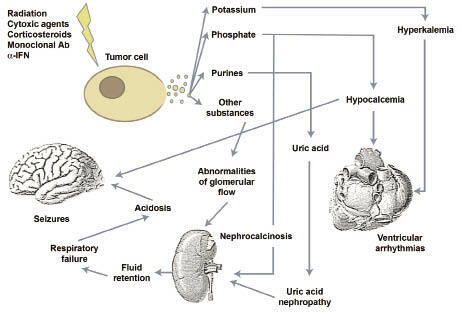 Tumor lysis syndrome (TLS) is a category of metabolic derangements which caused by the massive and rapid release of cellular constituents into the systemic circulation after the rapid lysis of malignant cells. The syndrome is seen most frequently after large amount of cell lysis in patients who exposed to cytotoxic therapy. Malignancies with high proliferative rate, large tumor burden, or high sensitivity to cytotoxic therapy are generally considered at high risk of TLS. The major interventions include hydration, metabolic abnormalities correction, and supportive treatment of renal failure. Electrolyte levels should also be monitored closely, and aggressive treatment should be taken if necessary. Complications resulting from TLS may influence the efficacy or further treatment of chemotherapy, and may cause death without immediate and adequent interventions. Early recognition, prevention and treatment can decrease the risk of those fatal complications.